Immigration laws and rules of different countries change quite often. Canada is no different. Changes in the rules and regulations happen very frequently. But this can lead to spreading of wrong and baseless rumors. 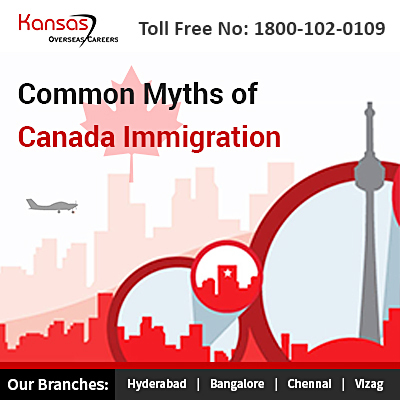 Here are some myths connected to the Canada immigration. Having a job in hand is not mandatory to come to Canada. If you come on a visitor visa or on study visa you do not need a job offer. Some temporary visas do need a job offer, but not all temporary visas have this condition. In case of permanent resident programs also it is not mandatory that you need a job offer. The express entry draws are for all those who have registered for the express entry point based program. A job in hand will only help the aspirant get more points and improve his ranking in the point based system. This is not true. If you want to migrate to Canada then you have to submit the test score results. There is a validity period for these scores. Once the validity expires, you will have to reappear for the exams. The applicant must keep in mind that command on the English language is mandatory if he wants to move to Canada, Majority of the immigration programs need English language test scores like the scores of IELTS, CELPIP, or TEF. What one needs to understand here is that the immigration program of any province or territory of Canada ultimately leads to permanent resident status. The freedom to live anywhere in Canada is one of the major benefits of Canada PR. Even the Quebec immigration program needs the approval of the Federal immigration department for approval of candidates. This also leads to permanent residency of Canada. Family sponsorship is surely one of the ways to come to Canada. But applicants must note that distant relatives cannot sponsor a person. It must be noted that permanent residents can sponsor their better half, common-law partner, or conjugal partner, their dependent children under the age of 19, or their parents or grandparents. Sponsorship by distant relatives is not allowed. This includes sponsorship by sibling, aunt, uncle, cousin, friend. As per the new rules of Express entry, the sibling factor may help a person get more points. Some provincial programs also have the option of sponsorship by distant relatives but this may be allowed only in rare cases. Believing myths can jeopardize your chances of getting a visa. It is, therefore better not to believe these rumors. But then from where can you get correct information? It is better to get in touch with visa agents. But here too you need to make sure that you select a reliable source. Always opt for an immigration consultancy which has a good reputation. Opt for a consultant who is well versed with all the rules and regulations of immigration. Select an immigration expert who is well updated with even the slightest change in the immigration rules and regulations. This will ensure that you are able to get the correct information.To get genuine details visit @ http://www.kansasxpress.com/contact-us or call 1800-102-0109.